The organization love.fútbol describes itself as a “nonprofit that mobilizes and engages communities to plan, build, manage, activate and redefine their own football pitches as sustainable platforms for social change.” It was launched in 2006 by Drew Chafetz and Alfredo Axtmayer, former college soccer teammates at Dickinson College. For the bulk of its history, love.fútbol has relied on grassroots funding and corporate sponsorship from the likes of Coca-Cola, ESPN, and Manchester City. Now comes recent news that the Pincus Family Foundation made a $1.135 million grant funding five projects in 2019, including two all-new community sports fields in Philadelphia’s lower income communities. This marks the first time love.fútbol has received a major investment from a foundation. 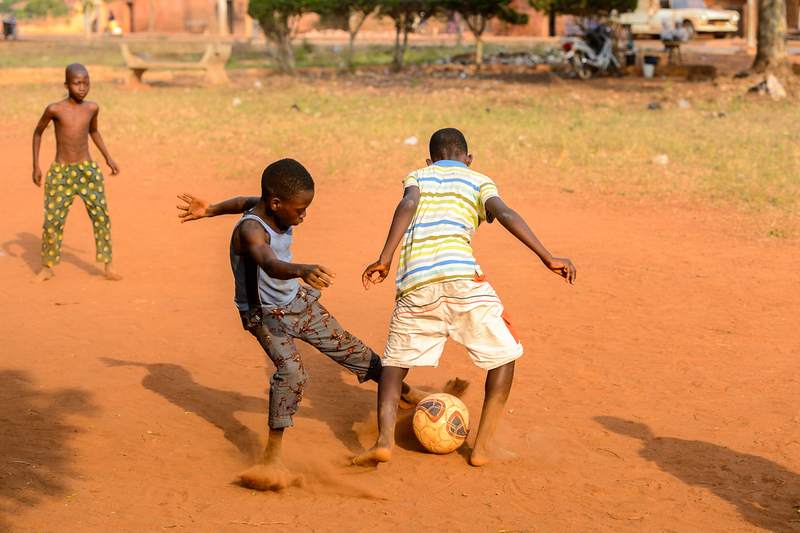 I recently spoke with love.fútbol co-founder Drew Chafetz and Pincus Foundation board member Eric Epstein to find out more about how the two organizations connected and their hopes for the big seven-figure gift. In the process, I learned how a nonprofit and a family foundation, each dedicated to helping children around the world, have fostered a strong philanthropic partnership. In college, when Chafetz was studying abroad in 2005, he traveled from Spain to Morocco and saw kids playing at a grassroots level again, creating spaces for play—even in the unlikeliest of places. He came across a group of kids playing soccer in an opening in an alley with a deep water canal running through their makeshift pitch. Despite these circumstances, children jumped back and forth effortlessly over the gap without looking, and their cracked plastic ball rolled relatively true over the cobblestone surface. This writer recalls his own Nigerian-born father waxing poetic about the concrete pitches he played on, and showing me his battle scars to prove it. While soccer’s simplicity draws millions of people the world over and can make the sport more accessible to urban and low-income communities, Chafetz started worrying about the kids that don’t have a safe place to play the game they love—like those boys next to the canal. “It crossed the line from imperfection to a bit dangerous and hard to romanticize. And it planted a seed in me. That moment changed the rest of my life,” Chafetz says. He adds that two stars of Brazil’s 2010 World Cup National Team each had a brother who was killed by a car while playing soccer in the streets as kids. On the heels of Morocco, Chafetz and Axtmayer went down to Guatemala for what he describes as a “three-week exploratory adventure” driven by one single question—“do kids face challenges while playing soccer?” Guatemala made sense to them because of its passionate soccer culture and its rank near the top of poverty metrics in the Western Hemisphere. Having identified partners, they returned to the states to do grassroots fundraising. They then moved back to Guatemala in earnest in May 2007, initially taking on their first nine projects. A key word for Chafetz and love.fútbol is “community.” The hardware, if you will, is an engaged community coming together around a sports-based project. But for Chafetz, the software is just as important, and wherever love.fútbol lands, they aim to lay out a programmatic side that is tailored to the needs of each community. But for Chafetz, the large gift from the Pincus Family Foundation represents a new age of funding for his organization. The foundation was established in 2005 by the late David and Gerry Pincus, Philadelphia philanthropists who dedicated themselves to learning first-hand about the challenges children face worldwide. In conversation with Eric Epstein, David’s nephew, he couldn’t have been more passionate about the philanthropic legacy his uncle left behind. “He was the crazy uncle that would show up with a convertible with a dog in the back. Was a huge personality,” Epstein says. The Pincus family wealth has its roots in a Philadelphia clothing company that David’s father and uncles founded in 1911. David and his brother went on to expand the business, and as David had success in business, he also emerged as an art collector. He and Gerry amassed abstract expressionist pieces by Rothko and other artists. When the company shuttered, David started to focus on philanthropy. “If you don’t feel something, it’s not worth pursuing. This was the underlying motive of his life,” Epstein explains. Much like Chafetz, David Pincus’ life was transformed through travel. David helped establish clinics in Harlem, South Africa and the Dominican Republic for children with AIDS. He also traveled to places like Somalia, Haiti and Israel, at times celebrating birthdays abroad. Epstein explains that when David was reaching the end of his life (he passed in 2011), he wanted to support this kind of global work for children even after he was gone. David willed the majority of his art collection to the Pincus Foundation, and the auction proceeds were underwrote the activities of the foundation. “You never get to own art; if you’re lucky, you get to live with it for a while, and then it moves on,” Epstein says, repeating what David often told him. This brings us to the story of how love.fútbol caught the interest of the Pincus Family Foundation. Epstein says that David used to support Smith Memorial Playground & Playhouse, an early public playground that has a sliding board that’s over a century old. Epstein has always been interested in children’s play, and while he eventually found architecture, he studied developmental psychology as an undergraduate and had plans to go into education. For a time, the Pincus Foundation had been looking for an ongoing playground project they could invest in. Epstein, though, explains that this was easier said than done, at times because of the difficult public-private dynamic and the politics involved. As this research was going on, Philadelphia lawyer Nick Sprague, chairman of the board of love.fútbol, connected with a Pincus board member and learned about Chafetz and his story. From the first conversation, the chemistry and alignment of mission was palpable, Chafetz tells me. In addition to the project just inaugurated in Mexico City, Pincus will fund four other love.fútbol projects—two in the Dominican Republic, and two projects in Philadelphia. Once they cut the ribbon for the first Pincus-backed project, Epstein describes the moment when Chafetz and COO Mano Silva stormed the field and played with the kids. Even with 10 kids hanging on them, they worked their magic. And throughout his stay in Mexico City, Epstein says he could feel his “Unc” hovering over.